Exam Date : January 19, 2019. 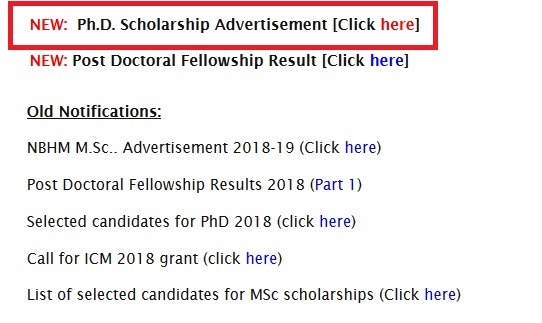 The National Board for Higher Mathematics (NBHM) invites applications for Scholarships For Pursuing Doctoral Program (Ph.D) In Mathematics For The Academic Year 2019-20. Eligibility to receive the NBHM Ph.D. scholarship is restricted to students who have completed their B.S./M.A./M.Sc. (or equivalent) degree and have secured admission to a recognized Ph.D. programme on or before August 1, 2019. Applications should be made in the format given at the end of this advertisement and should include a recent passport size photograph. Completed applications should be sent by e-mail, or submitted online, or sent by SPEED POST, as indicated below. The online registration will open on 10th Nov 2018 and the eligible candidates will be able to download hall tickets from 5th Jan 2018 onwards. Hard copies of applications will not be accepted in Zone 1. The test will be of 150 minutes’ duration and will involve questions with short answers. Question papers of some earlier years will be available on the NBHM website (URL given at the top) and on the IMSc website (www.imsc.res.in, under `Opportunities>Doctoral Programme>Mathematics’). ** Candidates must appear for a written test which will feature questions based on topics normally covered in masters degree programmes in mathematics. ** Based on the performance in the written test, candidates will be shortlisted for interview before nal selection. Successful candidates will receive a scholarship amount of Rs. 25,000/- (Rupees Twenty-five Thousand Only) per month for the first and second year and Rs. 28,000/- (Rupees Twenty-eight Thousand Only) per month for subsequent years, a contingency grant of Rs. 32,000/- (Rupees Thirty-two Thousand Only) per year and house rent allowance as per central government norms wherever applicable. ** December 7, 2018 – Last date for receiving applications. ** January 4, 2019 – Applicant should contact zonal coordinator if hall ticket is not received by this date. ** January 19, 2019 – Date of written test.